1 April 2007: In 2006, the US Conference of Mayors formed a task force to address “persistent poverty and middle class erosion” in American cities. The Task Force on Poverty, Work, and Opportunity, chaired by Los Angeles Mayor Antonio Villaraigosa, worked over a year to craft an action plan. In March 2007, the Task Force released a set of recommendations. While the report makes a convincing argument for a national strategy, its figures probably understate the true extent of poverty in the US. • Increased investment in high-quality public education, including universal preschool. • Increased investment in high-quality, life-long workforce training. • Public incentives to create more banking opportunities in distressed inner cities. 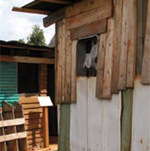 • Increased public investment in the infrastructure of poor urban neighbourhoods. The recommendations could cost US$23 billion annually to implement. While the US Conference of Mayors’ report makes a clear and convincing argument for a common national strategy to alleviate poverty, its calculations are based on the official federal poverty rate. The report notes that “more than 37 million people are officially poor today” in the US [italics added]. Many economists believe this “official” number seriously understates the true extent of poverty in the US. The current method used by the federal government to calculate poverty thresholds was designed in the early-1960s as part of President Lyndon Johnson’s War on Poverty. Essentially, It is a measure of severe deprivation  the minimum amount of money needed for subsistence. Poverty thresholds are absolute dollar amounts (e.g., $10, 210 for an individual; $20,650 for a family of four). The thresholds vary by family size, but not by geography. In other words, the same dollar amounts officially define poverty in both low-cost-of-living rural areas and high-cost big cities. Poverty thresholds are adjusted periodically using the Consumer Price Index, a measure of inflation. The overwhelming consensus of economists, policy analysts, social scientists, and mayors is that the official federal poverty measure is seriously outdated. Most analyses find that a revised poverty calculation would increase the number of Americans classified as poor. Therefore, a major barrier to redefining poverty thresholds is political. US presidents are reluctant to have official poverty numbers revised upward during their terms in office. Another barrier is financial, since expenditures for many federal programs are tied to the official poverty rate  the more poverty, the more the federal government would have to pay into these programs. In Canada, America’s neighbour to the north, poverty thresholds are not absolute income levels as they are in the US. They go beyond measuring only society’s most impoverished and most economically deprived and encompass a broader range of economic hardship. Poverty in Canada is determined by a Low-Income Cut-Off Line, the point at which individuals or families must devote 60 per cent of their annual income to basic necessities such as food, clothing, rent, transportation, insurances, child care, school supplies, and household supplies. Each metro area in Canada has a different Low-Income Cut-Off Line to account for regional differences in the cost of living. The conceptual and fundamental differences between the American and Canadian poverty measures are striking. For example, if we used Canada’s Low-Income Cut-Off Line to measure poverty in Rochester, New York  a typical mid-size American city  the poverty rate would not be 25.9 per cent, as officially defined by the US government, but 38.4 per cent. Using the Canadian standard, New York City’s poverty rate would not be the official 21.2 per cent, but 38.2 per cent. In San Jose, California  the center of Silicon Valley and the symbol of wealth and power in the US  the poverty rate would leap from 8.8 per cent to 20.9 per cent, when calculated according to the Canadian method. It is clear that the official federal US poverty measure is woefully outdated. The application of Canadian methodology to the US situation is not merely an academic exercise. 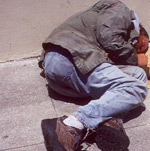 It illustrates that poverty in America goes well beyond the stereotypical image of the homeless vagrant or the drug addict. The new face of American poverty often includes the restaurant dishwasher, office clerk, deli worker, maintenance worker, single working mother with children, and, in some high-cost-of-living cities, the nurse, the firefighter, and the school teacher. The federal government’s reluctance to acknowledge the extent of economic hardship in the US doesn’t make poverty disappear. As the US Conference of Mayor’s report makes clear, it simply pushes the problem down to the local level and turns financially-strapped mayors into beggars for more federal support. In the United States, the term ‘inner city’ is commonly understood to mean poor, dysfunctional and Black. Nearly every large and mid-size American city has a core of neighborhoods where 40 per cent or more residents live below the federal poverty level. These concentrated poverty neighborhoods are characterized by abandoned and deteriorated properties, high crime, poorly-performing schools, drug markets and family breakdown. Concentrated poverty neighborhoods also produce their own urban culture - distinctive dress, music, speech patterns and behavior - that further isolates residents from the mainstream. Inner city dysfunction weighs heaviest on people of color. According to the US Census Bureau, 80 per cent of all poor African-Americans live in conditions of concentrated poverty versus 20 per cent of all poor whites.